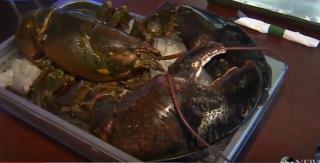 (Newser) – Larry the Lobster lives another day, thanks to a group of rescuers who saved the 15-pound crustacean from ending up on Florida diners' plates, the Miami Herald reports. Even more astounding: Although figuring out a lobster's age is an inexact science, the owner of the restaurant that acquired Larry estimates, based on the lobster's growth indicators, that the crustacean is about 110 years old. Tin Fish owner Joe Melluso tells ABC News that the lobsters he buys from vendors usually top out at 5 pounds. A picture of Larry circulated on social media, and a family reserved him for Tuesday night's dinner—until a group of other locals caught wind. Real estate lawyer Brooke Estren and friends pitched in $300 to buy him, plus shipping costs to send him to the Maine State Aquarium, where he'll be examined and either housed permanently or put back in the sea. the owner got choked up " i was going to sell that lobster for a healthy profit until someone decided to save him for an even healthier profit".